It was reported in the June 2018 edition of the Navy News that Ray who was a M(E)2 onboard died on the 4th May 2018 at the age of 76. R.I.P. Ken died very suddenly on 4th January 2018 with a pulmonary embolism at the age of 77. A celebration of life service will take place on Friday 26th January 2018 at the Isle of Wight crematorium at 12 noon. Our thoughts are with his widow Anne and daughter Nikki at this sad time. Ken attended the 2006 reunion in Babbacombe. R.I.P. Chris died from cancer on 12th September 2017. Our thoughts are with his wife Hilary and family at this sad time. R.I.P. It was reported in the September 2017 edition of the Navy News that Don passed away on 26th June 2017 at the age of 82. Don served in the RN from 1952 to 1975. R.I.P. Jimmy Green has just advised us that Peter passed away in Spain in May 2017 3 days after his 74th birthday. Walt died suddenly on Wednesday 9th November 2016 aged 74. Our thoughts are with his wife Patricia and family at this sad time. R.I.P. It was reported in the October 2015 edition of the Navy News that Jock Innes passed away on 5th September 2015 aged 68 years. R.I.P. It was reported in the June 2015 edition of the Ton Class Association (TCA) magazine that Pete Whellams has crossed the bar. Pete contributed several articles for the website when it first started up. R.I.P. Alick Lavers is sad to report that John Medland passed away on 19 August 2014. John and Alick were mates at school and joined the RN together in January 1951 at the age of sixteen. Co-incidentally Alick left Carysfort in Autumn 1965 and John took over his job temporarily in 1966. R.I.P. Ken passed away on 31 December 2012 aged 79. R.I.P. Clubz (Bungy Edwards) has just advised us that Ginge Warnes passed away around 12 years ago. Ginge was a pub landlord in Bristol and was brutally attacked one evening when he was out walking his dog. He didn't recover from his injuries and died around one month later. R.I.P. We have just heard from David Hedges that his father John Hedges passed away on 21 July 2011. John served as a Telegraphist onboard during the ship's first commission. R.I.P. Pete Barley has just informed us of the sad death of his oppo Soapy Watson of cancer last year on 22 April 2010 in L'Estartit, Costa Brava, Spain. Both Pete and Soapy attended the 2006 reunion in Babbacombe and as well as being shipmates in HMS Carysfort they also served together in Paladin and Armada. R.I.P. Jacqueline Land, widow of ex AB (R) Ken Land has advised us of Ken's death in Spain from cancer on 5 February 2005. Ken spent 22 years in the RN and attained the rank of MAA. R.I.P. Generations of sailors who visited Hong Kong will mourn the death of Jenny. She was a much loved figure and an incomparable institution for well over half a century. She died peacefully on 18 February 2009 at the age of 92. Much of her life was an enigma. However, the authors of her twenty seven Certifcates of Service generally agreed that she was born in a sampan in Causeway Bay in 1917. Her mother, Jenny One, according to her one surviving Certificate of Service, which was copied in 1946 from an older, much battered and largely illegible document, "provided sampans for the general use of the Royal Navy, obtained sand, and was useful for changing money".  Behind her perpetual great gold-toothed grin Jenny complained "I velly chocker. All time work in sampan. No lead or lite". But what she lacked in education she made up more than a hundredfold with her immense and impressive experience in ship husbandry; her unfailing thoroughness and apparently inexhaustible loyalty and integrity; her infectious enthusiasm and her innate cheerfulness. Officially Jenny's date of volunteering was recorded as 1928. From then until 1997, when the colony became a Special Administrative Region of China and the Royal Navy moved out, she and her team of tireless girls who at one time numbered three dozen, unofficially served the Royal and Commonwealth Navies in Hong Kong by cleaning and painting their ships, attending their buoy jumpers, and dressed in their best, waiting with grace and charm at cocktail parties. Captains and Executive Officers would find fresh flowers in their cabins and newspapers delivered daily. Many a departing officer received a generous gift as a memento of Jenny. For all of this she steadfastly refused ever to take any payment. Instead, she and her Side Party earned their keep selling soft drinks to the ships companies and accepting any item of scrap which could be found on board. Jenny's huge collection of photographs - too big she said to be put into books - she stored in a large envelope. They dated back to the mid 20th century and showed her in the ships she so faithfully served with Buffers and Side Parties along with grateful officers, many of whom became distinguished Admirals. In two thick albums she proudly kept her letters of reference, all without exception filled with praise and affection for her. One was a commendation from the Duke of Edinburgh for her work in the Royal Yacht during her visit to Hong Kong in 1959. She had a Long Service and Good Conduct Medal presented to her in 1938 by the Captain of the heavy cruiser HMS Devonshire and a Bar to the LS & GCM from the frigate Leander in 1975. Most treasured of all Jenny's distinctions was the British Empire Medal awarded her in the Hong Kong Civilian List of the Queen's Birthday Honours in 1980 and with which, under her formal name of Mrs Ng Muk Kah she was invested by the then Governor of Hong Kong, Sir Murray Maclehose. In latter years Hong Kong was no longer visited by the great fleets of the warships which gave jenny and her Side Party their livelihood and she found it increasingly difficult to make ends meet. Yet she stayed fit and willing to undertake any work available. To the end of the Royal Navy's presence in Hong Kong there could be seen in the shadow of the towering Prince of Wales building within the Naval Base, a small round figure in traditional baggy black trousers and high-collared smock with a long pigtail and eternal smile who, regardless of time remained it seemed for ever - just Jenny. Barry Notcutt, nephew of AB Tommy Notcutt has advised that Tommy died of a heart attack at the age of 33 in 1976. R.I.P. George Hale passed away on the 13th October 2008. R.I.P. Bill Elliot, AB first commission born 19th October 1926 died on the 6th March 2008. R.I.P. Rod Channell ex AB first commission born 18th January 1924 passed away on 6th June 2006 aged 82 years. R.I.P. Regret to inform you that my husband, James Kidd, died on November 20th 2005. (Gunnery Officer 1966-68). In his last weeks it gave him pleasure to read about the proposed reunion for later this year, and to read articles of interest on this website. All good wishes to everyone for 2006 - greetings from Scotland. Hope the big event goes off well and is enjoyed by all concerned. Steven Ayling, son of Lt (SD)(WE) L E Ayling - WEO 1966-68 has advised us of the death of his Father on 28th September 2005. 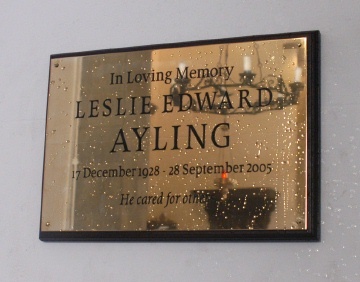 This plaque in recognition of Leslie Ayling's charitable work was unveiled in The Church of England Cathedral of the Holy Trinity Gibraltar a year after his death at a memorial service held there. The Leslie Ayling Charitable Trust is intended to support Gibraltar's poor and disadvantaged. However, from London to Ceuta and Gibraltar he cared for others anonymously. He gave discreetly, not just donations, but his time and himself.